The only way Bethany and Xavier can elude the Sevens is to hide in the open, and blend in with other mortals their own age. Gabriel and Ivy set them up at college, where they can’t reveal their relationship, and where there is still danger around each corner. Will Bethany be called back to Heaven - forever - and face leaving the love of her life? The narrator did an excellent job with all the voices of each character, male and female voices were better than most narrators I've listened to. I wanted more at the ending though. wanted to hear the reactions of her siblings seeing her and a little into their future. Also if God stepped in to do some correcting. The story was hard to stop listening to. I put a timer on so I can go to sleep and listen the next day, but ended up adding another 30-45mins to 1hr. This was a fitting end to the books,Heaven starts a bit slow, but stick with it as you will not be dissapointed with the end. Heaven is missing an Angel! 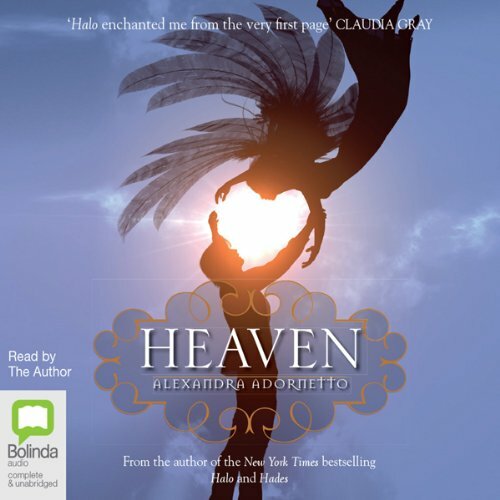 Heaven starts where Hades left off - with Xavier proposing to Bethany. I fell in love with Halo and thought Hades was fantastic so I wanted a fantastic ending to a fantastic series but it just left me disappointed! Her writing style in this book was unlike the other two (unfortunately). It was rushed at times and could have done with more depth! The ending - perfect but again - rushed! Beth is in Heaven for 2 years and it's cramped into a few chapters? Adornetto left so many questions unanswered!